Dream catchers have been part of Native American and First Nation cultures for centuries. They were first made by the Ojibwe people, and are traditionally made of willow branches and sinew, often to be hung up over a child's or infant's bed. As they sleep through the night, all of their dreams first pass through the hoop, which allows the good dreams to pass through, and catches the bad dreams in its spider web-like netting. When the sun rises, the bright sunlight makes the caught bad dreams disappear! 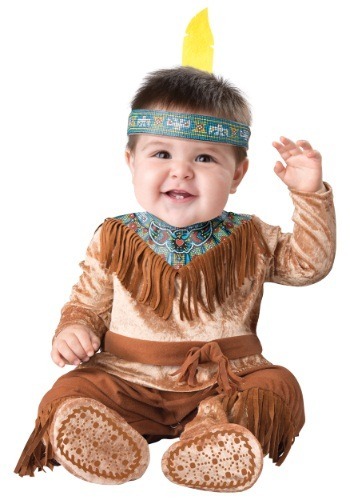 This Native American-inspired Sweet Dream Catcher look begins with a cozy, leather-like onesie that features soft and adorable frills on the top and leggings. The bead-like pattern printed around the collar of the costume and on the matching feathered headband adds fun colors and accents to the outfit. The bottom of the onesie features buttons for easy changing, and the attached booties have no-slip pads on the feet.